Vespers on the occasion of the Feast of St Basil the Great. Please click here to download the flyer to distribute to your Fellowships, Church noticeboards, or friends and family. PLEASE NOTE: The Carols will no longer be at the Festival Hall, but at the Melbourne Town Hall. A variety of traditional Christmas Carols in Greek, English and other languages for all ages. This is a combined Christmas celebration for all Parishes and Communities in Melbourne. All are welcome to attend and entrance is free. Snacks and drinks will be available for purchase at the Hall. Everyone is invited to come up to the Community Hall to listen and participate with the Choir on traditional Christmas carols in Greek and English. ADMISSION FREE. The Greek Orthodox Parish of St Haralambos is organising a fundraiser for the Monastery of Panagia Gorgoepikoos. Light refreshments, tea, coffee and Sunday School performing Nativity play. Donation at the door. St Raphael's Teens Group is hosting a Christmas party this year in order to raise funds for Paradise4Kids. All Teens are invited to come show their support and have an amazing time. Paradise4Kids helps poor, sick and suffering children in Africa and around the globe. $10 TICKET EVENT - ALL DONATIONS WELCOME! Please RSVP to: straphaelteens@gmail.com by Sunday the 9th of December. Music by DJ Dean and includes food & drinks. Tickets: $50 adult, $28 child (5-12yo) & $15 child (2-5yo). RSVP by Friday 7th December. Vespers on the occasion of the Feast of St Eleftherios. Matins and Divine Liturgy for the Feast of St Spyridon. Vespers on the occasion of the Feast of St Spyridon. NOTE: The services at the GEELONG MONASTERY are preceded by Greek/English Matins from 8:00 a.m. Following the talks, fish and chips will be provided. Vespers on the occasion of the Feast of St Nicholas. Vespers on the occasion of the Feast of St Barbara with His Eminence Metropolitan Myron of New Zealand presiding together with clergy from Melbourne. Matins & Divine Liturgy for the Feast of St Porphyrios of Kavsokalyva. Vespers on the occasion of St Porphyrios of Kavsokalyva. Vespers on the occasion of the Feast of St Andrew. Matins and Divine Liturgy on the occasion of the Feast of St Stylianos the Righteous celebrated by clergy from Melbourne. In honouring the Saint, it is an opportunity to also celebrate our Archbishop's Name Day. Vespers on the occasion of the Feast of St Catherine. The Central Youth Committee NSW is hosting a young adult retreat 23rd to 25th November 2018. Some fantastic keynote speakers lined up for an action-packed weekend in November. This is an event aimed at nurturing the faith of young people 18 to 30 years old. It's also a chance to hang out with friends and meet new people. Vespers on the occasion of the Feast of the Presentation of the Holy Theotokos to the Temple. 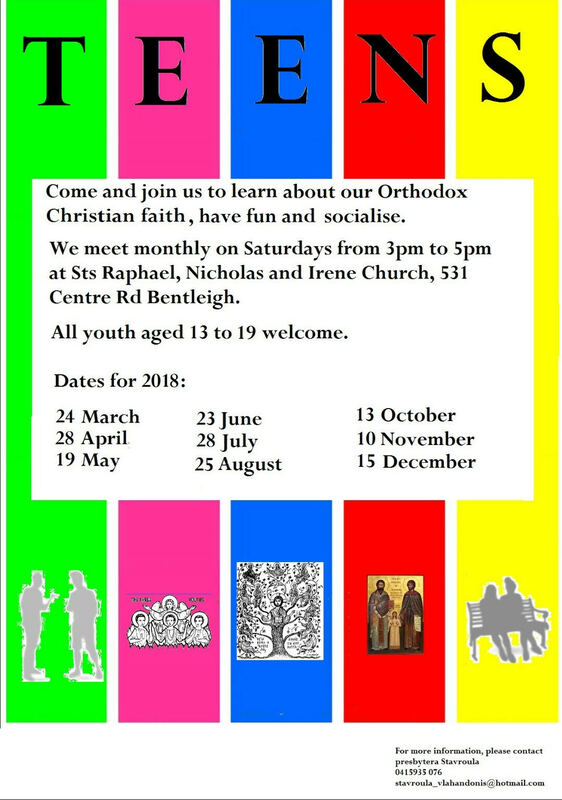 Teens, come and join us to learn about our Orthodox Christian faith, have fun and socialise. We meet monthly on Saturdays from 3pm to 5pm. All youth aged 13 to 19 welcome. Please click here to download the flyer with contact details and all the dates for 2018. Vespers on the occasion of the Feast of St John the Merciful. Greater Dandenong has some of the highest rates of homelessness and food insecurity in Australia. Saint Panteleimon Church is going to make 500 sandwiches that will be donated to Dandenong based food bank Avocare to help those in need. All equipment and ingredients will be provided. We only need your help to make these sandwiches. Organised by Saint Panteleimon Greek Orthodox Parish and Community of Dandenong and District. Matins and Divine Liturgy for the Feast of St Arsenios of Cappadocia. Vespers on the occasion of the Feast of St Arsenios of Cappodocia celebrated by His Grace Bishop Ezekiel of Dervis together with clergy from Melbourne. At this service, His Grace will be installing the icon of St Arsenios on the veneration stand. Vespers on the occasion of the Feast of St Nectarios. Vespers on the occasion of the Feast of the Archangels. 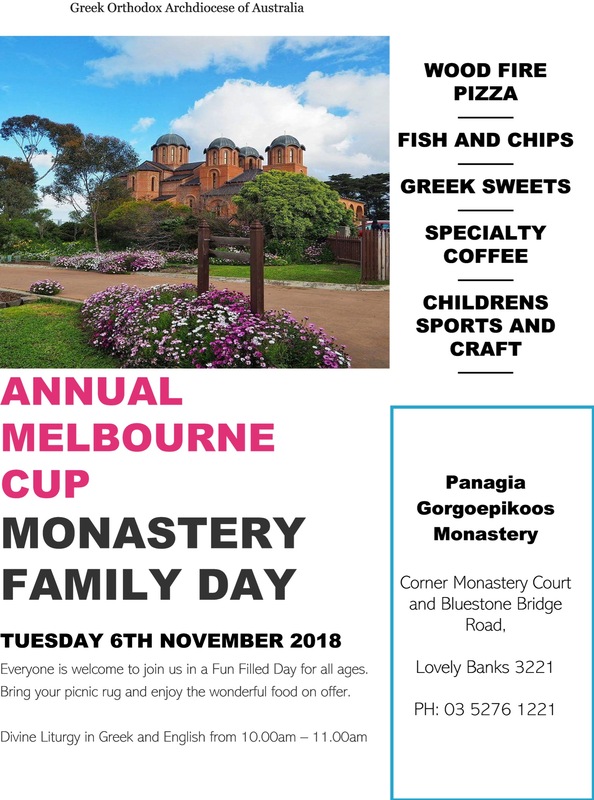 Everyone welcome to come and enjoy a fun filled day for all ages at the monastery. The Divine Liturgy will take place in the morning in Greek and English from 10.00—11.00am followed by fun games & activities for all ages. BYO PICNIC LUNCH or enjoy the delicious fish & chips, wood fire pizza and Greek sweets that can be purchased on the day, as well as coffee. Please click here to download and email/print this flyer to distribute to your Fellowships, Church noticeboards, or friends and family. Topic 2: Positive Thinking and God (Jim). Vespers on the occasion of the Feast of Sts Anargiri, Cosmas and Damian the Unmercenaries. Church Service and Doxology, wreath laying ceremony. Followed by festival and panigiri. Vespers on the occasion of of the Feast of St Dimitrios celebrated by clergy from Melbourne. Matins & Divine Liturgy on the occasion of the Feast of St James (Iakovos) the Apostle celebrated by clergy of Melbourne. This is one of the most ancient Liturgies of the Church and is different from the other Liturgies in that the clergy stand at the Altar facing the congregation. Also, Holy Communion is distributed to the people in a similar way as is normally given to the Priests - i.e. the Body of Christ is given separately and then the Blood of Christ is received directly from the chalice. Join us for a wonderful afternoon with delicious treats and raffle prizes to be won! $5 admission fee to reserve seat, assist with catering and entry to win door prize! Kids under 5 free! Bookings: Liz 0419 337 261 or Niki 0449 051 226 by 17 October. Matins and Divine Liturgy on the occasion of the Feast of the Translation of the Holy Relics of St Lazarus. Vespers on occasion of the Feast of the Translation of the Holy Relics of St Lazarus. $50 per person, $25 kids aged 5-12. Food and drinks included. Raffles and prize for the best fancy dressed. All proceeds will go towards the Holy Monastery Panagia Axion Estin. 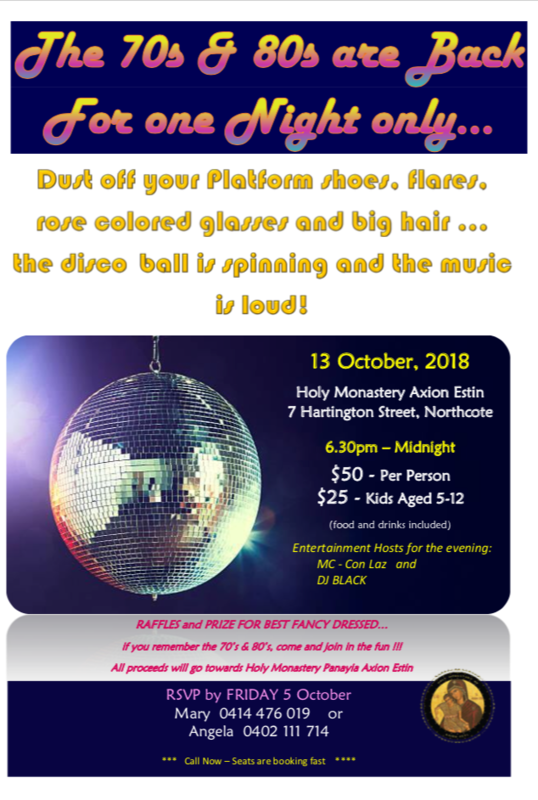 RSVP Friday 5th October to Mary 0414 476 019 or Angela 0402 111 714. After the much-welcomed participation by Father Jean Mawal and members of the St Paul's Antiochian Orthodox Church at the Dandenong September fellowship meeting, we look forward to the reciprocated invitation to attend Bible study at St Paul's parish for the October fellowship meeting. Our theologians, Dennis and Vasili will be present as well as many of our regular group members. Once again, everyone is welcome. Dandenong fellowship will return to normal 'first Thursday of the month' schedule in November. The talk that was being prepared for Monday 8th October has been postponed. Speaker: Very Rev. Fr Themi Adamopoulo from the Orthodox Mission of Sierra Leonne. Matins and Divine Liturgy on the occasion of the Feast of Panagia Gorgoepikoos celebrated by His Grace Bishop Ezekiel together with Clergy from Melbourne. Vespers on the occasion of the Feast of Panagia Gorgoepikoos. Saint Panteleimon Church is going to make 500 cream cheese and vegemite sandwiches that will be donated to Dandenong based food bank Avocare to help those in need. To help out please email your name and mobile to stpanoutreach@gmail.com and we will then send you a confirmation email with all the details. Vespers on the occasion of the Feast of Our Lady of Myrtles. Matins and Divine Liturgy celebrating the Feast of St Eustathios and his family. Vespers on the occasion of the Feast of St Eustathios and his family. Great Vespers on the eve of the Feast of the Exaltation of the Holy Cross of Our Lord. Topic 2: The Feast of the Transfiguration (Bill) – (Bill's talk has been carried over from the August fellowship meeting). Matins and Divine Liturgy on the occasion of the Feast of the Birth of the Holy Theotokos. Vespers on the occasion of the Feast of the Birth of the Holy Theotokos. Tickets $55 Adults, $25 Children 5 to 12 years old and free for children 4 years of age and under. Three course dinner and drinks (beer, wine, soft drinks). Bookings essential. 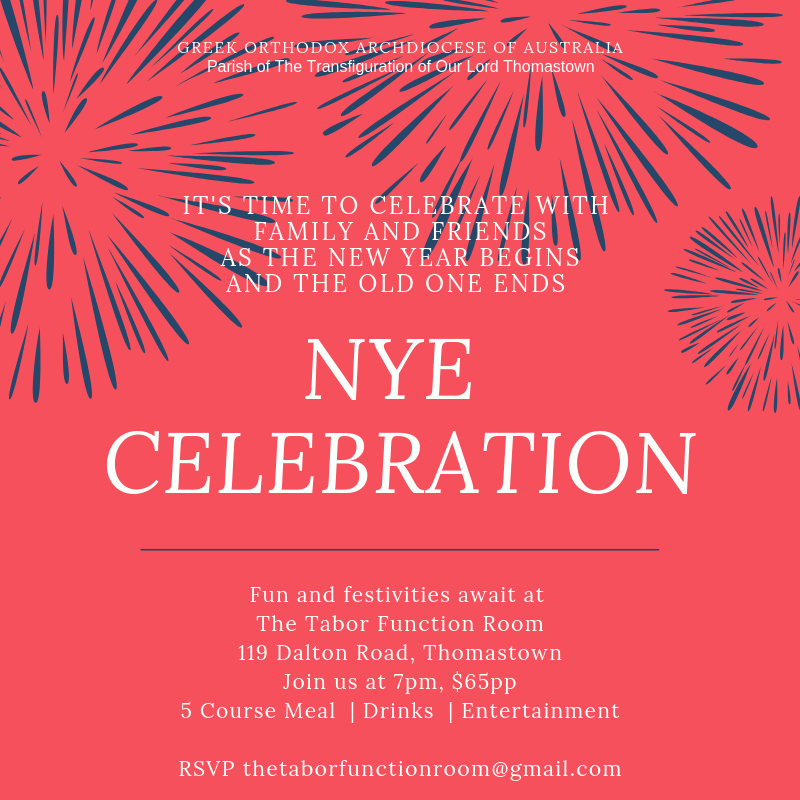 Contact Kathryn 0421 434 775 or via email saintharalamboschurch@gmail.com to book a table or individual seats. Small Compline, Great Vespers, Matins & Divine Liturgy of Saint John Chrysostom. ‘Exploring Orthodoxy’ is an open day and conference wrapped into one. A range of presenters will speak on various aspects of Orthodox spirituality, icon preparation will be demonstrated and resources will be available for purchase. Children will be catered for with a program of craft, games and story time. A light lunch and refreshments will be served. Andrew Ziogas (Diploma of Byzantine music, St John's Seminary) will be running two chanting classes. Andrew is an experienced teacher who has been teaching chanting since 2006. Lessons will be conducted in English and will be structured to learn Byzantine notation and modes of Byzantine chant. Greek and English manuscripts will be provided. Lessons are open for adults and high school aged children. We encourage attendees to attend both classes (15th and 22nd August). Following the Divine Liturgy, there will be food, drinks and sweets available. There will also be dancing performances. Everyone is invited. Matins and the Divine Liturgy, officiated by His Grace Bishop Ezekiel of Dervis. Afterwards, there will be food, drinks and sweets available. Vespers on the occasion of the Feast of The Dormition of our Lady with His Grace Bishop Iakovos of Miletoupolis presiding together with Clergy from Melbourne. For all high school students and their parents. Fr Elias Kentrotis, Fr Demos Nicolaou, Fr Leonidas Ioannou. Separate discussion groups for teens and parents will take place following the talk. Matins and Divine Liturgy followed by annual Greek festival celebrations. Free entry, Greek music and dancing, large marquee, two halls, souvlakia, loukoumades, drinks, kids activities. Matins and Divine Liturgy 7:30-11am. Following the Divine Liturgy is the yearly Parish Festival, with Traditional Greek Dancing performances, souvlakia, live music, and Greek dancing for all! Matins and Divine Liturgy on the occasion of the Feast of St Panteleimon, followed by fish lunch, $25 per person, prepaid tickets only. Vespers on the occasion of the Feast of St Panteleimon. Matins and Divine Liturgy and a Litany of the Holy Relics and the Wonderworking Icon of Saint Paraskevi, Presided by His Grace Bishop Iakovos of Militoupolis. Vespers on the occasion of the Feast of St Paraskevi presided by His Grace Bishop Ezekiel of Dervis, accompanied by the Clergy and Faithful Christians of Melbourne. After the Vespers there will be a Paraklesis to Saint Paraskevi. Matins and Divine Liturgy celebrating the Feast of the Holy Prophet Ezekiel with His Grace Bishop Ezekiel of Dervis celebrating his Name Day and presiding at the Liturgy with several clergy from Melbourne. After the conclusion of the Divine Liturgy, Father Elias will give an informal talk. Tea, coffee and finger food will be provided. Donation at the door. All donations will go towards the parish building works. Fundraising luncheon for the parish after the Divine Liturgy in the Church hall, $35 Adults, $25 children under 12 years, all inclusive. For seating please text Fr Panagioti on 0411 804 410. Matins and Divine Liturgy in the Chapel of St Markella, celebrated by His Grace Bishop Iakovos of Miletoupolis. Vespers on the occasion of the Feast of St Markella the virgin martyr of Chios celebrated by His Grace Bishop Iakovos of Miletoupolis. Matins and Divine Liturgy in the new Chapel of St Paisios, celebrated by His Grace Bishop Iakovos of Miletoupolis. Vespers on the occasion of the Feast of St Paisios of the Holy Mountain in St Paisios's Chapel, presided by His Grace Bishop Ezekiel of Dervis. All monies raised will go towards painting the Church. $50 per head. Booking is essential, RSVP 1st July to Mary 0414 476 019 or Angela 0402 111 714. FOR CHILDREN AGED PREP to YEAR 12. An Archdiocese SCHOOL HOLIDAY event. Interactive Discussions with Bishops and Clergy, their Graces Bishop Ezekiel and Bishop Iakovos will be in attendance. 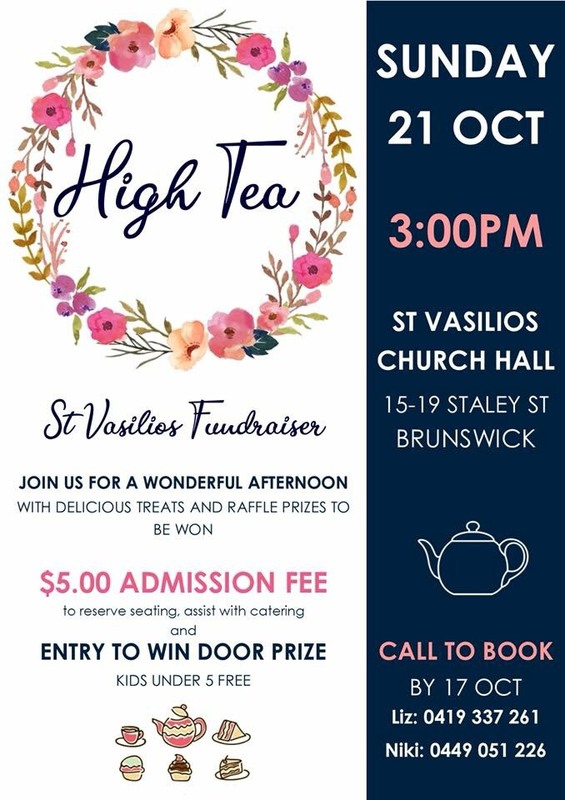 Sporting Activities, Social Games, Craft activities for primary children, Morning/Afternoon Tea and Sausage Sizzle Lunch, Each child takes home a Goody Bag valued at $15, Orthodox bookstore with English books will be available on the day (cash only). All discussions and activities will be in English and divided into different age categories. Cost: $40 per child. Limited places available! REGISTRATION ESSENTIAL BEFORE 15/06/2018. NO REGISTRATIONS ON THE DAY ACCEPTED. For further details, please call Marianne 0431 639 911 or Emma 0434 002 945. Matins and Divine Liturgy on the occasion of the Feast of Sts Anargiri, Cosmas and Damian the Unmercenaries, and the Feast of All Saints of Crete with His Grace Bishop Iakovos of Miletoupolis presiding. Vespers on the occasion of the Feast of Sts Anargiri, Cosmas & Damian and All Saints of Crete celebrated by His Grace Bishop Ezekiel of Dervis together with clergy from Melbourne. COST: $45 Adults, $20 under 12, FREE under 3.
please call 9465 9907 or 0408 003 002 to arrange bookings. Proceeds go towards our building fund and new car park development. Matins and Divine Liturgy in the Chapel dedicated to the Saints, celebrated by His Grace Bishop Iakovos of Miletoupolis. Vespers on the occasion of the Feast of Sts Peter and Paul The Apostles, officiated by His Grace Bishop Ezekiel of Dervis and the participation of the Clergy of Melbourne. Come and learn how to make the Church bread. Vespers on the occasion of the Feast Day of the Northcote Monastery. 27th May 2018 PENTECOST SUNDAY "KNEELING PRAYERS"
Sunday 27th May 2018 is "Pentecost Sunday" and, after the Divine Liturgy, all Churches will be celebrating the Vespers of the Holy Spirit. Within this Service, there are three long prayers that are read by the priest while we all kneel to receive the grace of God and to be renewed by the Holy Spirit. 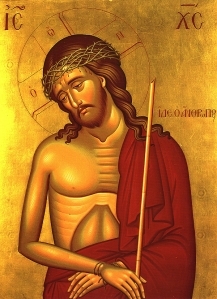 We have these prayers in English available for download from our "Orthodox Christianity" section. Please download the flyer for Pentecost which you can print and take to Church on Sunday. Feel free to email/print and distribute copies to your Fellowships, local Church parishioners or friends and family. You are invited to an evening of dinner and dancing. All proceeds will go towards the painting of the church of Holy Monastery Panagia Axion Estin. The DJ will be playing all your favourite tracks. Cost: $60, includes dinner and drinks, dancing and lots of fun. Dress: Wear your favourite 70's-80's outfit! Best dressed male and female will win a prize. If you are not so game, come in smart casual. Please contact Angela 0402 111 714 or Mary 0414 476 019 to book your seats. 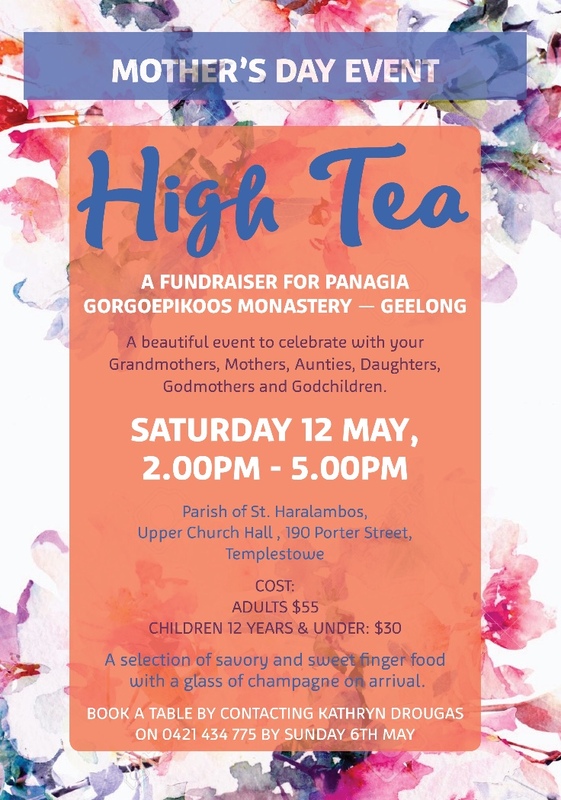 Mother's day high tea fundraiser for Panagia Gorgoepikoos Monastery in Geelong. Come along with your grandmothers, mothers, daughters, aunties, nieces, Godmothers and Godchildren. There will be a raffle on the day also and all funds raised from tickets and the raffle will go directly to the Geelong Monastery. Adults $55, Children 12 and under $30. RSVP by 6th May Kathryn Drougas 0421434775. Very Rev. 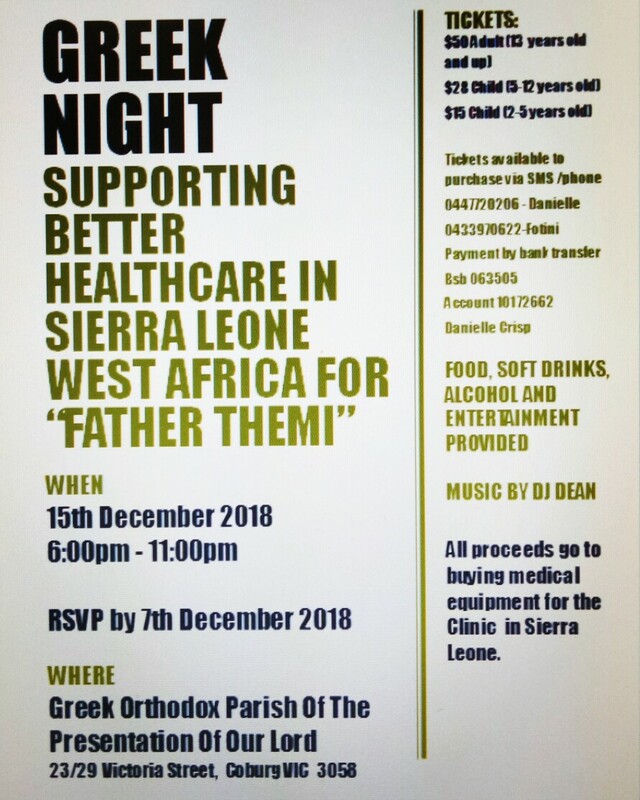 Fr Themistocles Adamopoulos from Sierra Leone will be presiding along with Fr Leonidas Ioannou. PreTeen/Teen Youth Group Guest Speaker and Family BBQ. Constable Liz Sidiropoulos will be talking to our Teens and Preteens about cybersafety, drugs, binge drinking, personal safety and much more! We encourage all families with teens/preteens to attend this discussion and ask that parents also stay to become informed about these issues and continue the conversation at home. Last time Liz came to talk to the youth, she captivated their attention and started some great conversations. After the talk we will have a bbq for all youth and families. Please RSVP via the Facebook event button https://www.facebook.com/events/621743761509194? ?ti=ia or email saintharalamboschurch@gmail.com to allow us to cater for the correct number of people. 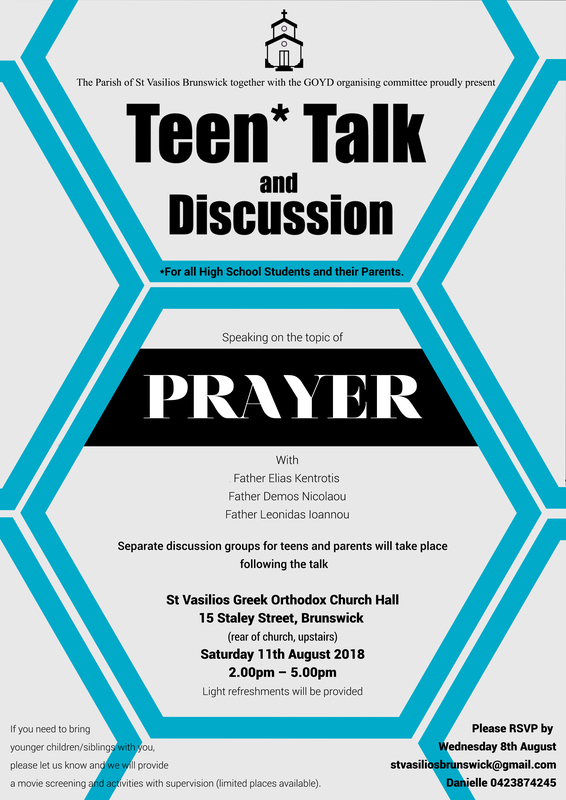 Update for Saturday 28 April: The St Raphael Teens will be going on an excursion to St Haralambos parish in Templestowe, to join the Teens there for a session with Senior Constable Liz Sidiropoulos, who will be discussing crucial youth issues such as cyber-safety, substance abuse and personal safety. This will be followed by a family BBQ. Parents are welcome to attend. We will meet one hour earlier than usual, at 2pm at Bentleigh Church hall, 531 Centre Rd Bentleigh and car pool from there to Templestowe. We will be returning to Bentleigh by 6:45pm. Please email stavroula_vlahandonis@hotmail.com to RSVP. Vespers on the occasion of the Feast of St George the Great Martyr presided by His Grace Bishop Ezekiel of Dervis together with clergy from Melbourne. Pan Orthodox Paschal Vespers for Panagia Portaitissa of Mount Athos, presided over by His Eminence Vasilios Metropolitan of the Antiochian Orthodox Patriarchate in Australia, along with His Grace Bishop Ezekiel of Dervis, the clergy of Melbourne and clergy representing all canonical Orthodox jurisdictions of Melbourne. Vespers will be celebrated in various languages. The choirs of St. David the Psalmist (Greek Orthodox Church) and St. Romanos the Melodist (Antiochian Orthodox Church) will be chanting the Vespers service. Matins and Divine Liturgy on the occasion of the Feast of Sts Raphael, Nicholas and Irene. Celebrated by Their Graces Bishop Ezekiel of Dervis, Bishop Iakovos of Miletoupolis and the clergy of Melbourne during which the Holy Gospel of the Resurrection is chanted in various languages. Followed by distribution of blessed PASCHAL EGGS. Learn about Greek Orthodox Easter traditions, such as lambada decorating, koulouria baking, folding palm crosses, dyeing red eggs and more! Parents are more than welcome to attend. The combined annual Parade and Memorial for the celebration of Greek Independence Day. All Welcome. Vespers on the occasion of the Feast of the Annunciation of the Holy Theotokos with His Grace Bishop Ezekiel of Dervis presiding together with Clergy from Melbourne. The members of this new Church are asking the community for an ‘Expression of Interest to be part of a Car Boot Sale Fundraiser’. There will also be kids' entertainment, food, drinks, prize giveaways and raffles. People can sell items they wish to get rid of, new businesses, old businesses can sell products too. Any left over items can be donated to the church and they will be auctioned off on the day as well. All inquiries can be made to Nikki on 0438 587 425 or Fr Paul on 0414 231 461. The Mystery or Sacrament of Healing where we seek the grace of God's healing and forgiveness. 3rd Salutations to the Holy Theotokos (7:30-9:00pm) followed by NIGHT VIGIL ACCORDING TO THE RUBRICS OF MT ATHOS. His Grace Bishop Iakovos of Miletoupolis will be presiding together with Fr Damaskinos of Mt Athos and other Clergy. Matins will be followed by the Divine Liturgy. You can attend in person or via Skype. A very solemn and beautiful way to enter the period of Great Lent. His Grace Bishop Ezekiel of Dervis will be presiding together with His Grace Bishop Iakovos of Miletoupolis and they will be joined by the Clergy of Melbourne. At the completion of Vespers, we enter Great Lent by seeking the forgiveness and blessing of our Clergy as well as from one another. Fr Prodromo is a priest serving in Cameroon. The talk will be about the ministry in Africa in Cameroon and also about Great Lent. Talk in Greek/English. Divine Liturgy from 7:30am-11:30am, followed by the Parish Greek Festival. Celebratory Matins & Divine Liturgy on the occasion of the Feast of St Haralambos. PLEASE NOTE: This year it has been moved 1 day earlier because the feast day of St Haralambos falls on Saturday of Souls (which takes precedence over the feast day). Vespers on the occasion of the Feast of St Haralambos. Vespers on the occasion of the Feast of the Presentation of Our Lord in the Temple presided by His Grace Bishop Ezekiel of Dervis together with clergy from Melbourne. Topic 1: Rublev's Holy Trinity Icon. Topic 2: Preparing for Lent - The Significance of the three Sundays before Lent. Vespers on the occasion of the Feast of the Three Holy Hierarchs (Sts Basil the Great, Gregory the Theologian and John Chrysostom) presided by His Grace Bishop Ezekiel of Dervis together with clergy from Melbourne. This Service will celebrate the Opening of the New Legal Year and will be presided by Clergy of various Orthodox Churches in Melbourne. Present at the Service will also be Judges, Barristers, Solicitors and Article Clerks. All are welcome to attend, especially those of the legal profession. Vespers on the occasion of the Feast of Saints Athanasius and Cyril, Patriarchs of Alexandria presided by His Grace Bishop Ezekiel of Dervis together with clergy from Melbourne. Vespers on the occasion of the Feast of St Anthony the Great presided by His Grace Bishop Ezekiel of Dervis together with clergy from Melbourne. This is a combined celebration for all Parishes in Melbourne celebrated by Their Graces Bishop Ezekiel of Dervis and Bishop Iakovos of Miletoupolis together with all the Clergy of Melbourne. The Blessing of the Waters ceremony will be commencing 1:00pm SHARP and will be followed by music, dancing and activities for children until late afternoon. Also, food and drink will be available at the Pier together with a variety of other stalls. Topic 1 - The Symbolism of the Baptism Service. Topic 2 - St Sophronius of Jerusalem and the feast of Holy Epiphany. Everyone is welcome. CLICK HERE TO GO BACK TO UPCOMING EVENTS.